As a library subject-specialist, I can speak on a variety of topics for your library school, association, or library system. 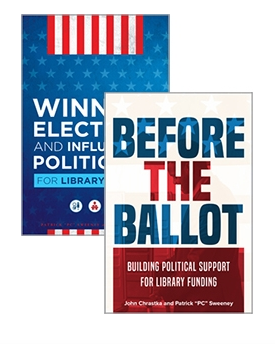 I specialize in training librarians to understand and influence political power structures for improved funding and community support. I am currently the Political Director for EveryLibrary and lecturer for San Jose State University iSchool, where I teach political advocacy. 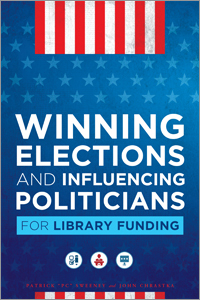 I am also the co-author of the recent book from ALA Editions called Winning Elections and Influencing Politicians for Library Funding. I offer full or half day staff training on political literacy skills, speaking and keynotes for staff development days, in-services, conference programs, and pre-conference workshops. As a former library administrator I have the ability to relate to the workplace challenges and professional development goals of library staff, trustees, and friends. If you are looking for fresh and engaging presentation topics and styles, I have been providing these skills to libraries for the last nine years. Download my speaking guide for complete 2018 speaking descriptions and rates. I have been a frequent speaker, presenter, and workshop leader at staff training days and library conferences around the country as well as a participant in the Great Library Roadshow. I was a 2015 Library Journal Mover and Shaker for my advocacy work and my conference presentations are focused on supporting your conference theme with stories and best practices backed by data and research that are inspirational, motivating, and actionable for your attendees. I address individual outcomes as well as organizational engagement with relevant content to address your unique library community. Slides from a limited number of presentations are available on slideshare. Please note that if you choose me as your library conference keynote speaker or workshop leader, an additional conference program presentation or panel elsewhere during the session day is included, if desired. Keynotes and speaking engagements – My current average honorarium for standard speaking engagements is $2,000 as well as expenses for travel and stay. If you choose me as your conference speaker, an additional conference program presentation or panel elsewhere during the conference is typically included. Half Day Workshop – My current average honorarium to conduct a half day training for staff or conference attendees on a highly specialized subject area tailored to your organizational needs is $3,500 as well as expenses for travel and stay. Attendees of a half-day workshop will typically develop a work-plan or an in-depth understanding of a actionable subject area. Full Day Workshop – My current average honorarium to conduct a full day training for staff or conference attendees on multiple highly specialized subject areas is typically $5,000 as well as expenses for travel and stay. Attendees of a full-day workshop will typically develop a holistic understanding of specific subject matter and walk away with a implementable plan of action. Webinars – My current average honorarium to conduct a one-hour webinar on specific subject areas is typically $500. Virtual attendees and organizations will receive the same care and attention as in-person workshops. Most speaking topics can be tailored for webinar formats. Multi-Day Workshops- I can customize multiple day trainings for a more in-depth approach to staff training. Multi-day training events allow your staff and attendees to gain a full understanding of concepts and subject matter. Please contact me for rates. Please contact me directly or through the contact form below for more detailed information about honorarium and travel expenses as well as my availability.